Fr. 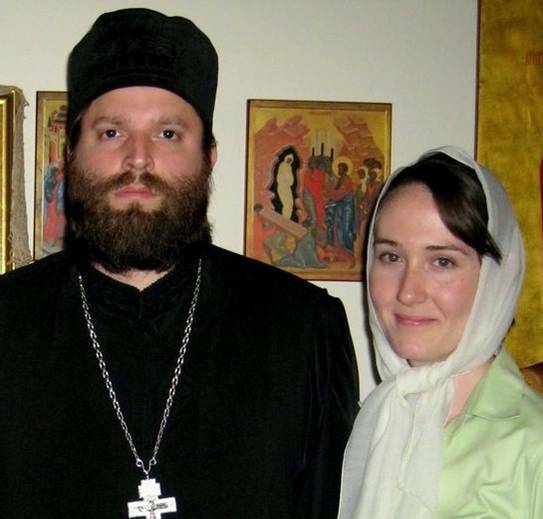 Demetrios and his wife Marina are converts to the Eastern Orthodox Church. They were raised as Protestants and, by the grace of God, found the Church in their early twenties and late teens respectively. They have a 3 year old daughter Emilia. According to Fr Demetrios, he had felt called to the priesthood since his conversion and after receiving his Bachelor’s degree from a secular university, applied and was accepted into the Master’s program at the Faculty of Theology in Thessaloniki. To date, Fr Demetrios has completed all the requirements toward a Masters in Dogmatic Theology, with the exception of his thesis defense and is preparing to continue his education with the blessing of Metropolitan Hilarion. While studying in Greece, Fr Demetrios will be serving and receiving a stipend from the Greek Orthodox Church. After his return he will resume his duties in ROCOR as pastor and hopefully, professor of Theology. In order to be granted a salary in Greece, Fr Demetrios was obliged to submit documents to the department of External Church Affairs in Athens to prove him a member of a canonical Church. The process took several months due to administrative changes at the Moscow Patriarchate and the Harper family was left without income. They were unable to pay their rent in Greece or make their car payments consequently incurring a debt of over $7,000. “With the money that has been provided, we will be able to pay off a portion of our debt and continue our endeavor in Greece. Again, thank you for your generosity. Please remember us in your prayers. "All youth benefit form exposure to the larger Orthodox world"